Omigosh this looks so good!!! Me and my sister loves these books and we are always reading them!! If I win this me and my sister will probably be up half the night reading it together! Lol. thank you so much for the opportunity! I would LOVE to have this book, well, because, look at it yourself! It's funny and full of puns. A very good joke book. It's AMAZING! I really want it. I also really like animals. I'm even in your book club! National Geographic Kids is the best thing since sliced cheese! 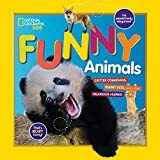 The book has it all, funny animals, puns, tongue twisters, and good jokes. I would rate you guys 100/10. I love National Geographic! I read your magazines daily. The book is the best! I would be honored to have it! Thank you!